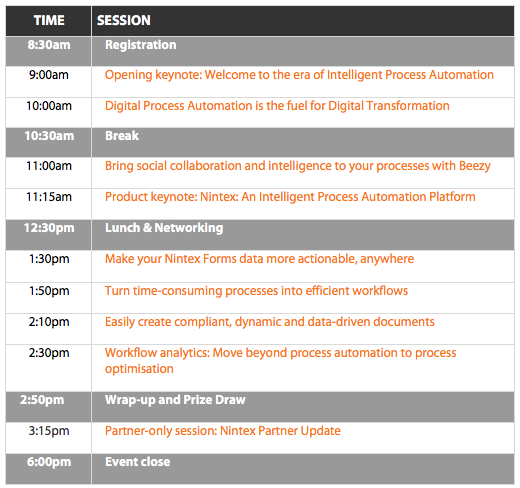 Learning about the new intelligent process automation capabilities from Nintex is great, and seeing them in action at the Nintex World Tour events is even better. See how data, artificial intelligence, and machine learning can add intelligence to your process automation — and learn first-hand how the Nintex Workflow Platform is evolving to meet the modern workplace. Join us at one of our European Nintex World Tour events to learn how companies like MAN Diesel & Turbo and Arriva are using Nintex to digitally transform their companies, automate sophisticated processes, and free up their employees to be more strategic, creative, and innovative so they can remain competitive in today’s changing business world. Registration for the World Tour event is complimentary, but spaces are limited. Reserve your seat today!